How to aggregate points from multiple time series with or without interpolation. Standard aggregation functions (e.g. 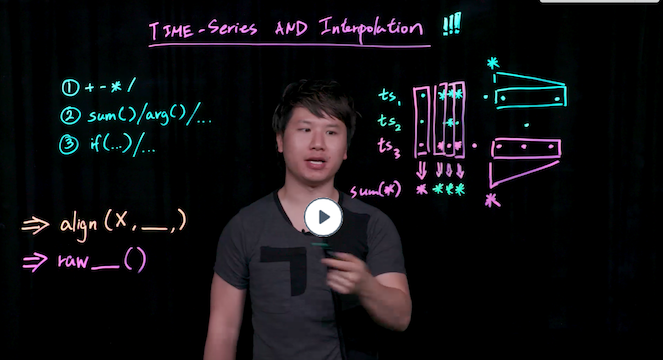 sum(), avg(), or max()) first interpolate the points of the underlying set of series, and then apply the aggregation function to the interpolated series. These functions aggregate multiple series down, usually to a single series. Raw aggregation functions (e.g. rawsum(), rawavg()) do not interpolate the underlying series before aggregation. Moving window functions (e.g. msum(), mavg() and mmax() aggregate series horizontally across a chart by time. They take each individual series and aggregate its own prior behavior across the timeWindow. For example, you can get the maximum value for each series in the specified time window. The easiest way to see the results of an aggregation function is when all of the input series report their data points at exactly the same time. This causes the points at any given timestamp to all line up. The aggregation function operates on the values in each lineup of points, and returns each result in a point at the corresponding timestamp. For example, consider the two time series in the following chart. The reporting interval for these series is 1 minute, and the points in these series “line up” at each 1-minute mark on the x-axis. We use a point plot to reveal the correspondences between reported points. 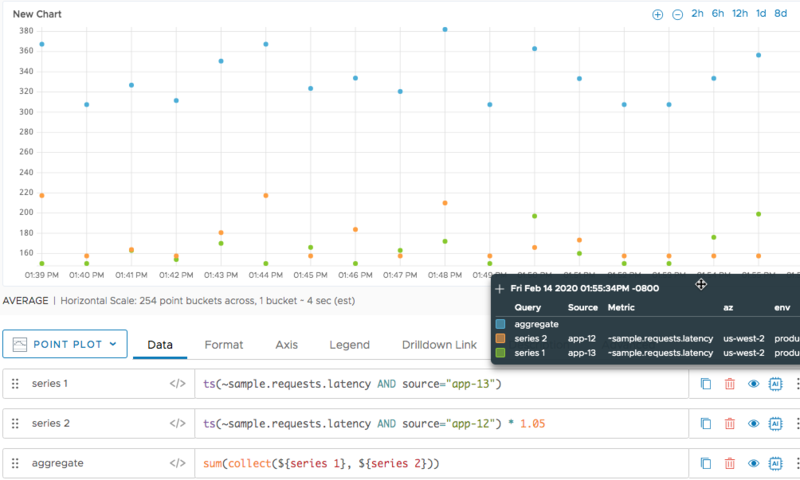 Now we use the sum() function to aggregate these two time series. Each blue point produced by sum() is the result of adding the data values reported by the input series at the same minute. All input series might report data points regularly, but some might report at a longer or shorter interval than the others. One input series might report at irregular times that don’t match the reporting times of any other input series. One otherwise regular input series might have gaps due to reporting interruptions (e.g., intermittent server or network downtime) which are not experienced by the other input series. Standard aggregation functions fill in the gaps in each input series by interpolating values, and therefore operate on interpolated values as well as actual reported data points. Raw aggregation functions do not interpolate the underlying series before aggregation, but rather operate only on actual reported data points. Standard aggregation functions fill in the gaps in each input series by interpolating values. For example, let’s start with a pair of series with reporting intervals that do not line up. In the following chart, series 1 reports once a minute, and series 2 reports once every 2.5 minutes. Both series have data points aligned at 4:25 and again at 4:30. Between these times, we see unaligned data points – 4 points from series 1, and one point (at 4:27:30) from series 2. Now we use the sum() function (a standard aggregation function) to aggregate these two time series. In the following chart, we see that sum() produces a result for every moment in time that a data point is reported by at least one input series. Whenever both series report a data point at the same time (for example, 4:25), sum() returns a data point whose value is the sum of both reported points (169.05 + 162 = 331.05). The result at 4:26 is more interesting. At this moment in time, sum() returns the value 328.430, although there is only a single input data value (164) at that time, reported by series 1. sum() produces the return value by adding 164 to an interpolated value from series 2. Interpolation inserts an implicit point into series 2 at 4:26, and assigns an estimated value to that point based on the values of the actual, reported points on either side (at 4:25 and 4:27:30). sum() uses the estimated value (in this case, 164.43) to calculate the value returned at 4:26. 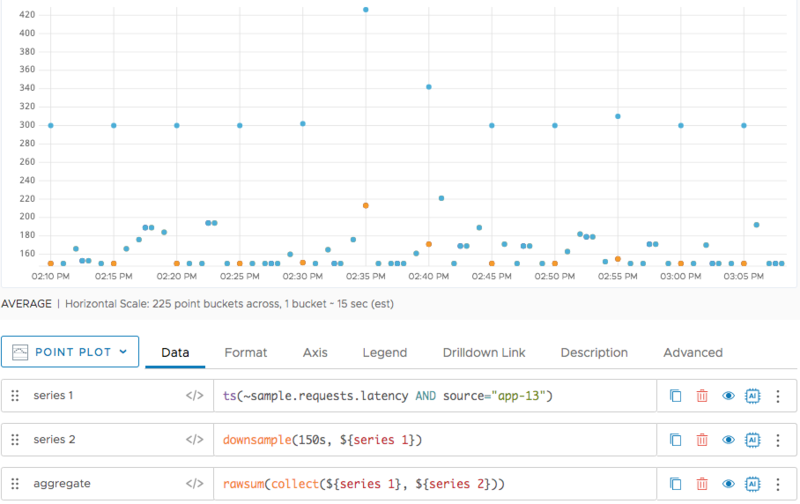 When at least one other input time series reports a real data value at the same moment in time. In our example, no values are interpolated at, say, 4:26:30, because neither input series reports a point at that time. You can use raw aggregation functions instead of standard aggregation functions if you want the results to be based on actual reported values, without any interpolated values. For example, you might use raw aggregation results as a way of detecting when one or more input time series fail to report a value. 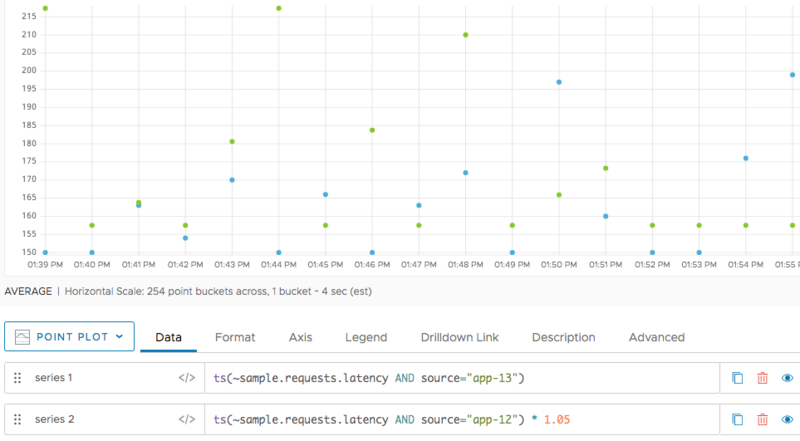 Let’s see how the raw aggregation function rawsum() treats the two sample time series from the previous section. The following chart shows that rawsum(), like sum(), produces a result for every moment in time that a data point is reported by at least one input series. Unlike sum(), rawsum() produces its results by adding up just the actual values at each reporting moment. At 4:26, for example, rawsum() returns 164.00, which is the only value reported at this time. No values from series 2 are present at that time, and none are interpolated. Whenever both series report a data point at the same time (for example, 4:25), rawsum() returns a data point whose value is the sum of both reported points (169.05 + 162 = 331.05). sum(ts(~sample.cpu.loadavg.1m)) shows the sum of the values reported for the metric from all sources. sum(ts(~sample.cpu.loadavg.1m, source=app-1*)) shows the sum of the values reported for the metric, but only from sources that match app-1*. sum(ts(~sample.cpu.loadavg.1m, source=app-1*, env=prod)) further filters the input series to those with the point tag env=prod. Each aggregation function accepts a ‘group by’ parameter that allows you to subdivide the input time series into groups, and request separate aggregates for each group. The chart displays a separate line corresponding to each group. For example, you can use a ‘group by’ parameter with sum() or rawsum() produce a separate subtotal for each group of time series that are reported from a common source. The chart for such a query displays one line corresponding to each source. When used without a ‘group by’ parameter, an aggregation function returns a single series of results. The sourceTags parameter behaves a little differently from the other grouping parameters. sourceTags produces a subgroup that corresponds to each source tag that is explicitly specified in the ts() expression. No other source tags are taken into account. For example, suppose you added 3 source tags (prod, db, and highPriority) to the metric cpu.loadavg.1m, and now you want to use the sourceTags parameter with sum() to return subtotals based on the source tags. In contrast, a ‘group by’ parameter like pointTags produces a separate aggregate corresponding to every point tag that is associated with the specified time series, even if the ts() expression does not explicitly specify any point tags as filters. The chart below represents 3 unique series reporting latency data. The sections with dashed lines represent gaps where no data is reported. Two of the reporting series have gaps of missing data between 9:15a and 9:21a. One reporting series has a gap of missing data between 9:36a and 9:42a. The following chart shows what happens when we apply sum() (blue line) and rawsum() (orange line) to the three time series. The lines are different because interpolation occurs with the standard aggregation function (sum()), but not with the raw aggregation function (rawsum()). When there is at least 1 true data value reported at a given interval, standard aggregation functions interpolate data values before executing the aggregation. Between 9:15a and 9:21a, the orange series reports once a minute, on the minute, while the other two series do not. Because the orange series reports at least 1 true data value during this time, Wavefront interpolates the values for the blue and green series before calculating the sum() value. Between 9:36a and 9:42a the green and orange series report data values every minute, but the blue series does not not. Wavefront does interpolation before aggregation. Raw aggregation functions on the other hand calculate aggregates based on actual reported values (no interpolation). Between 9:36a and 9:42a, the rawsum() values are approximately 2/3 of the sum() value (2 of 3 series reported values). Note that the gap between 9:27a and 9:30a is exactly the same regardless of which aggregation function type we use. None of the series included in the aggregation reported a data value during this time. As a result, the standard aggregation function does not apply interpolated values during this gap, and the result of aggregation looks the same for sum() and rawsum(). The behavior differences between standard and raw apply to all aggregation functions (sum, avg, min, max, count, variance, percentile).